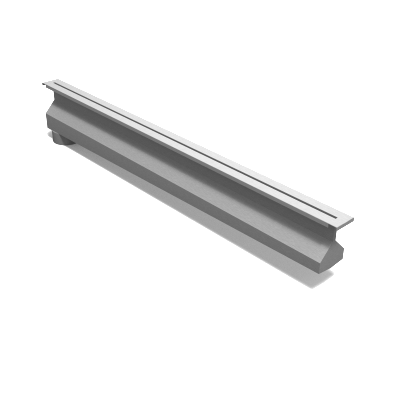 For interior or exterior off-the-floor drainage. Single-unit construction eliminates three problems usually encountered with frame-type drains that are bolted together: leaks caused by vibration and traffic, possible infiltration of waste water into surrounding areas, and misalignment. In addition, when the anchor flange encircling the body of the drain is embedded in concrete, the unit becomes an integral part of the floor. Because the bottom of the drain is prepitched, installation costs are substantially reduced. If the area is to be tiled, there are further savings because the straight edges of the Trench Drain eliminate special shaping and cutting of tiles. ​single-unit construction of drain body: Anchor flange makes unit an integral part of floor. Standard tapped outlet is shown, but a straight spigot or a 90° spigot elbow connection is available. The sectional cover grates are built of premium, high-strength, non-breakable steel for long life and high resistance to atmospheric corrosion. 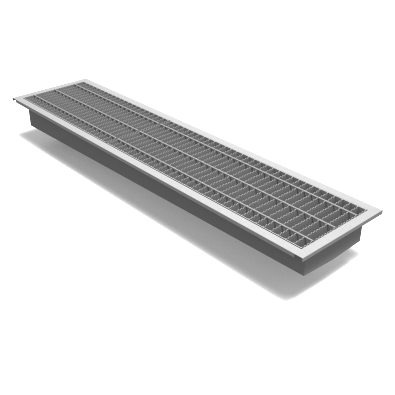 Various types of cover grates are available in addition to the heavy-duty steel grates. Stainless steel is recommended for use in hospitals, laboratories, and similar installations. Nonskid diamond pattern grates are also available. All cover grates can be furnished in vandal- and tamper-proof designs. Grate openings shall be equal to 21/2 times the pipe to which the drain is connected. 6" pipe has an open area = to 28.8 sq. inches – grate must have 72 sq. inches of open area. Choices of grate openings include 3/8" x 3" slots, 3/8" or larger circular openings, or 1/4" circular openings for safety concerning small-heeled shoes. 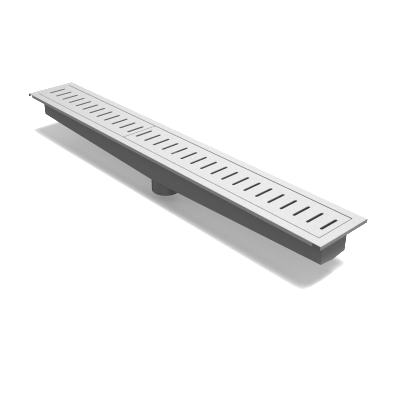 The standard length of each grate is 2 feet; however, if a special size drain is ordered, the length of one cover grate will be adjusted accordingly. 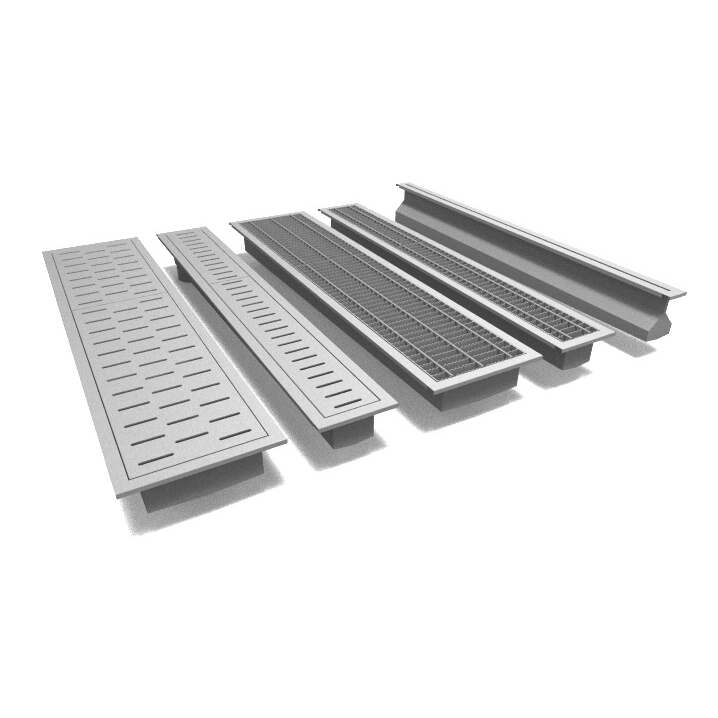 For hospitals, laboratories, and similar jobs, the entire drain can be ordered in stainless steel, or the standard drain can be ordered with stainless steel cover grates.